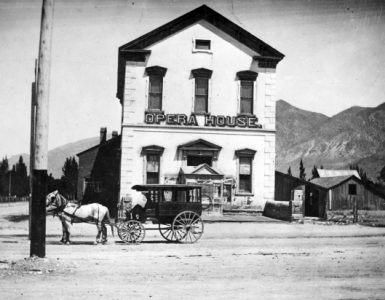 In 1890 Abigail Snow Rosenbaum sold the property north of the actual Rosenbaum Hall to a son, David Rosenbaum of Kelton, Utah. He converted the building to the Gem Saloon, with some of the Caldwell sons (his half-brothers, since Abigail was married to a Caldwell prior to her marriage to Rosenbaum) also taking charge as proprietors when he went to Kelton to manage his store there. “The Gem saloon was indefinitely closed Tuesday night. Business is so quiet, Manager D. Rosenbaum concluded to close up for the month or so,” stated the Brigham Bugler of April 4, 1891. 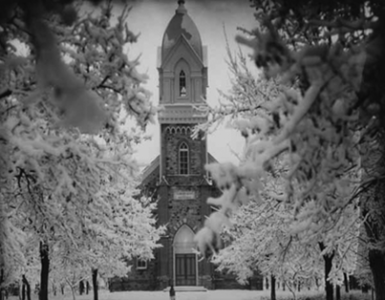 Soon afterward the property was mortgaged and later sold to Lorenzo Snow in 1899. The north 25 feet was sold to A. W. Compton for construction of his new photo studio. The Gem Saloon did not fare well, but Wilson’s Saloon, with R. K. Wilson as proprietor, had a longer life. In the late 1870s, the saloon was located on the “north string” road for about six months before moving into its newly erected building on the east side of Main Street, midway between Forest Street and First South. The city’s only saloon had enough customers to be a prosperous business but was not popular with much of the community. In October 1879, the city passed an ordinance that after January 1880, no intoxicating liquors of any kind were to be sold in the city. By March they found that they had to permit the sale of liquor for medicine and other uses, and so special people were picked to sell liquor and they paid 5% of their sales for their license.1Olive H. Kotter, “Brigham City to 1900,” Through the Years, (Brigham City: Brigham City Eighth Ward, 1953), 17. Wilson paid Brigham City an annual license of $1,200. In 1886 he asked for the right to sell lager beer and 498 people signed a petition against it and won their case. However, this was later overturned, and the Wilson Saloon is listed among businesses in 1890. Later saloons were allowed but with a high license fee because the city fathers did not want them in town. In 1892 a partnership between Charles W. Knudson, a prominent financier and church leader who owned the Union Block at 57 South Main Street, and Robert L. Wilson began. Knudson owned land south of the one-story Wilson Saloon and he convinced Wilson to go into business with him and relocate his saloon to the north side of a new building that Knudson was constructing. By June 1892 the saloon was demolished and the new building, with a stone foundation and two stories of brick, was underway.2Larry Douglass, nomination for National Register of Historic Places, (Brigham City: Brigham City Museum-Gallery, May 1991) Wilson Saloon moved into its quarters in November 1892, and Knudson’s fruit produce business opened in its new home in 1893.3Brigham Bugler, (Brigham City, November 18, 1893), 3.